Krang and Shredder manage to get the huge Technodrome moving upward toward the surface of the Earth. With the power fully restored to it, Krang transports the Minimizer from Dimension X to Earth. The Minimizer has the power to shrink anything. When Krang starts shrinking the nation’s military bases, April and the Turtles are alerted. The Turtles head to the moving Technodrome, enter it and try to sabotage it, while under attack from Bebop and Rocksteady. Meanwhile, April follows the Minimizer to see where it is headed. While April tails the machine, the Minimizer starts shooting at her and the van flips over with our heroine stuck inside. As the Technodrome surfaces and starts heading towards April’s van, the Turtles seize control of the Minimizer and shrink the Technodrome. They also return the military bases back to their original size. 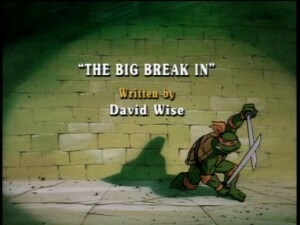 Tiny as a softball, the Turtles and April watch as the Technodrome falls beneath the earth once again.